These kinds of albums bring back faith in music. However, there is always the other side – somebody must get drowned to be appreciated. I will only add, that David Bowie called Grace his desert island album and this, I think, sums up this debut album well. The main thing that should be remembered is that Jeff was only starting. This album sounds complete, but it’s because he was really talented. Listening to Grace is facing mature and well-produced songwriting, however it can be so, cause music circa 1994 was not at peak of it powers. There is nothing from that era worth to be compared to Grace; it’s even more obvious in context of debut albums. I don’t mean this is the best album of 1994; there are few easy to find candidates for that spot – like Geek the Girl (possibly the best rock album by a woman). I think, that Grace is, simply put, the most impressive/best debut album of the year it was released. It’s unmatched by anyone who tried recording neoclassic-rock album, that year. And all of this, speaking of music, works truly well – especially in historical context. I mean, starting album on such a high note as “Mojo Pin” and ending it with another highlight “Dream Brother”, must have been appreciated by critic. Jeff Buckley’s tragic death must have brought an attention of worldwide audience. This couldn’t have failed in becoming a commercial success. There is also, on this album, the superb version of “Hallelujah”, but I will just say it’s one of very few recordings, that could be called the most resonant ever. So, I wanted to skip comparison of Jeff with his father, Tim. But, I believe that it needs to be mentioned. On his debut album Jeff makes music in manner, similar to his father, although they were composing different kinds of music. Jeff’s music is more hard-rocking. Tim Buckley, who died long before Jeff started recording, was creator of very ambitious psychedelia. Jeff’s Grace is better than Tim’s first two albums, but with Happy Sad Tim reached more advanced level than Jeff at his beginnings. Anyway, both of these artists are recommendable, especially if you like one of them already. This is it; Grace is one important debut album. Give it a try, because every true music lover should know it. It is quite a fun to also check comments on this album; I can call it a mind-opening experience. The cooler than cool band realising the cooler than cool debut, …but it’s not that good, you know. I have chosen to review this album as the beginning of my upcoming “Kacper’s Fantastic Debuts” series because this is a fantastic debut. However, I believe that it would be the least fantastic album in the whole set. From 2016 A.D. perspective things aren’t looking too brightly for this album. It surely is regarded as inventive, but think when was the last time you have listened to this thing in whole. My main point is that this thing has simply got dated. Just like the Byrds’ albums before, Psychocandy reached the point where it should be respected for being ground breaking, without regarding it as a cohesive masterwork. If you feel offended, please don’t be and don’t hate me for this view. I consider myself sort of a fan of these guys, but I believe that they have got better with time and reached their peak few years later. 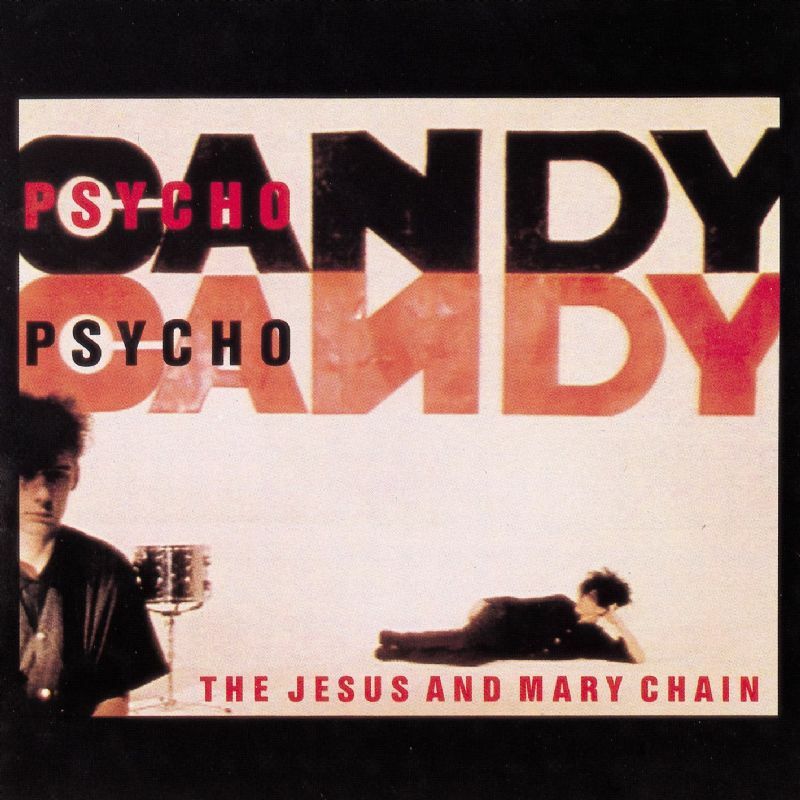 During the time of their debut Jesus & Mary Chain were most definitely a punk-rock band making psychedelic music, this was most extraordinary phenomenon. They caused riots, were, described as truly dangerous, and most of their concerts couldn’t last for half of planned time without causing the audience destroy all of surroundings. These guys were big in spirit, which turned out to be a curse for them and might have prevented them from making a huge career. So back then this album had a huge impact on certain masses, but these guys were still rookies. Brothers Reid, Jim on vocals and William on guitar, who are the only constant members of the band, made Psychocandy a hard thing to categorize, but at the same time it is hard to sit through. Other words, we face the work, which was consciously planned to be intriguing. The punkish vibe is present in each every of songs, unluckily it does not fit most of psychedelic arrangements. This is obviously revolutionary manner, the way the songs are presented, although there is no actual structure in between them. The songs alone are mostly not memorable, and please don’t be outraged, I must admit that each of them has something to offer, but it is not a display of virtuosity, or a marvellous melody, at least not in the most of cases… Speaking of a marvellous melody, it is present here only in one example of timeless, classic rock music, which is, of course, the opening track “Just Like Honey”. I won’t even describe it, if you know it, I am not able to improve it for you, and if you aren’t familiar with this song, well go listen to it. It is so epic that it made it to be a soundtrack for Sofia Copola’s movie with Bill Murray – lol. After such a high-note opening we are flooded with lots of noise and when I star to wonder if it’s all worth it, I am saved by two thrilling numbers “Some Candy Talking” and “Never Understand”. The first one – great Lou Reed-ish ballad, the latter is famous Beach Boys influenced song given a noise-rock treatment. What I try to state is, if all of the songs were as good as these three, I would certainly include this album in my Top 10 debuts list. The rest is unfortunately different, but I believe it depends on your own attitude towards them. Like I have mentioned, each of songs has something to offer and it may make more sense if you carefully study the lyrics, yet this is not a job of a reviewer. Musically most of the songs in here are not standouts and this is it. I respect the effort of this guys, of making resourceful take on psychedelia, which seemed to be adding something interesting to the abandoned genre. Yet, it was not a triumph that has improved standards set before, so it is kinda hopeless effort – from my perspective, it’s sth quite particular for 80s’ music scene. The most ridiculous thing, concerning this album, are attitudes of some “professional” critics towards it. First of all, calling it “an album with one trick and one trick alone – Beach Boys melodies meet Velvet Underground feedback and beats” by Allmusic reviewer, is dumber than dumb, mainly because there are none of these things on the record. Jesus & Mary Chain were definitely influenced by Beach Boys and Velvet Underground, but they do not sound alike to each of them and most definitely not like both of them. Compositions of Reid bros. are derived of vocal harmonies and their sort of psychedelia is very differently sounding to one of the VU’s (I don’t even mention lyrics). Generally, the review of Psychocandy on Allmusic site is one piece of garbage. The other strange conduct of critics towards this album is shown by their incredibly high marks for it, like 9,6 by Pitchfork, 10/10 Drowned in Sound, and five stars by almost anyone who gives stars. This is seriously pathetic to mark an album so highly, without giving nearly no reasons to state for its perfection. I personally like this music, but I am able to easily find it far from being perfect. Jesus & Mary Chain were simply starting and it is later, on an album called Automatic, they would come up with their minor masterpiece. Anyway, there are too many problems with this band, for me to place them in the first league. I will extend this subject in a different review, but here it is important to mention that they were Scottish… yeah they could be best at least in one category. It is also important to mention, these guys were making music, which was focused on the spirit and this is why it does not always rule. They simply were the opposite of Pixies, what I mean by that, they focused too much on mood they wanted to transmit, instead of maximizing the effect by using minimum of effort. When you look at this album like that, it becomes obvious why it is rated so well and not being listed on most of charts, or generally not often listened to. Because I don’t want to finish this review on a harsh note, I will give you an advise. This album has an unique use, the one and only in the whole world of music. If you want to troll your parents, or somebody of an older age, you can introduce them to alternative music by playing Psychocandy loud. Wait for their reaction after they reach the second track. The review is also available here.